In a decision that surprised some fans, Gonzalo Higuain finally announced his retirement from international football. Although his time with the Argentina national team spans almost a decade, long time Albiceleste supporters would never forget his debut. It was on the same night when the ‘one more miracle of Saint Palermo’ took place. Since then, he has scored 31 goals in 75 caps for Argentina, making him the sixth top all time goal scorer for the national team. Those goals includes two hat-tricks, against South Korea in the 2010 World Cup and against Chile during the 2014 World Cup qualifier. Unfortunately, whether it’s fair or not, his career will be always be remembered for the wrong reasons. When a professional footballer decides to hang up his boots, he is usually celebrated for all that he has achieved for his team, the memories he has given his fans and the trophies collected. There are also fair percent of those retiring players who are either forced into retirement or remembered for the wrong reasons. Gonzalo Higuain certainly thinks he belongs to that fraction. Higuain was part of the same Argentine team that made it to three consecutive major finals (2014 World Cup, 2015 Copa America & 2016 Copa América Centenario) only to end up finishing as runners up in all of them. On all three occasions, he was branded as the culprit for missing three glorious chances. Had he scored and made the most out of those chances, he would have, alongside Lionel Messi, Kun Aguero, Javier Mascherano, Angel Di Maria and the rest from this golden generation, achieved success for Argentina that is unprecedented. But as fate would have it, it was never meant to be. Fans would certainly remember the days when Argentina needed him yet he was overlooked by coaches. Back in 2006, Higuain was one of the upcoming young player for River Plate, a product of their renowned academy. In the same year, he scored twice in the Superclásico against fierce rivals Boca Juniors. There were some great reviews circulation around the world already on what a player he could become. When he opted for a move to Real Madrid, many felt that it was a premature decision to join them. Real already had the Ronaldo El Fenômeno and Ruud Van Nistelrooy. There was almost no chance of him getting first team action. His breakthrough would come in 2008-09 season when Nistelrooy suffered an injury. Higuain was called up by manager Bernd Schuster to take the lead striker role. He would go on to have a flourishing year for Madrid, scoring 22 goals in La Liga. The following season, his place as the club’s lead striker came under threat. President Florentino Perez brought in Karim Benzema as part of his Galacticos policy. But that did not deter Higuain’s form as he still ended up as the club’s top scorer. As far as his club career is concerned, Higuain never looked back since breaking through at Real Madrid. He would go on to seal himself as one of the top strikers for them until his departure to Italy in 2013. He would still preserve that status during his time with Napoli and Juventus. While his stock was rising with Real Madrid, the same can’t be said of him when it comes to the national team. He wasn’t named in the Under-20 side that took the 2007 FIFA U-20 World Cup in Canada. Argentina’s managers Alfio Basile and his successor Diego Maradona have both consistently overlooked him. There was a reason to believe that Sergio Batista who was then managing the Olympic side wanted to include him in the squad that would compete in the Beijing Games. When the time came to finalize the squad, however, Higuain’s name was missing again. It was hard for many fans to digest this fact back then as to why national team coaches opted to exclude Higuain from their list, especially when he was in such good form for his club. Let us not forget that he was eligible to play for France, having been born there when his dad was playing for FC Brest and yet chose Argentina over France. One reason that many argue was Maradona’s obsession with deploying shorter players, as he preferred strikers like Messi, Aguero or Carlos Tevez. There were also rumours circulating back then that he was caught having an affair with teammate, Fernando Gago’s girlfriend while the latter was on national team duty. These speculations merely fuelled the cause for his absence from the national team even further. It was only after a string of losses that Diego Maradona finally decided to include him in a World Cup qualifier against Peru in 2009. It was the night in which Martin Palermo was ‘inducted into his sainthood’ for his 93rd minute strike. But equally important was that Higuain made his debut with a bang by scoring Argentina’s first goal of the night, and the rest is history. If fans could pick just one moment in Pipita’s career that they would cherish for a lifetime, it will certainly be against Belgium in the 2014 World Cup. The last time Argentina made it to the World Cup semi-final was during Italia ’90. Since the nineties then the quarter final has always been their Kryptonite. Getting over that hurdle has proven to be an enormous task for them. A game against the European Red Devils in 2014 was their best chance ever to break this hoodoo. But this Belgian side was more than capable of pulling off a miracle; and Argentina’s form in this campaign had not been so spectacular, creating discomfort within the fan base going into this game. Fans were hopeful but were very cautious at the same time, as past experiences might come back to haunt them. Lionel Messi had dragged Argentina out of the group stage and was now under a tight control of opposition defenders. It would be premature to expect anything even if we were talking about Messi. Angel Di Maria had become the saviour against Switzerland in the round of 16. Kun Aguero wasn’t at his best in the tournament. All that was left was if Higuain could do something. The Belgians started the game brightly but Argentina were forcing themselves and getting more confident going forward. In the 8th minute, euphoria overcame Albiceleste supporters as a Higuain strike from the edge of the area and into the bottom corner beat Belgian goalkeeper Thibaut Courtois. It was an even encounter throughout the rest of the game with Belgium having a better possession of the ball. Argentina did have their moment to kill them off but were undone by poor finishing. The fans were nervous and anxious as the clock kept ticking. All hell broke loose after the final whistle. A sense of jubilation rippled through the air as Argentina finally made it to the semi-final. 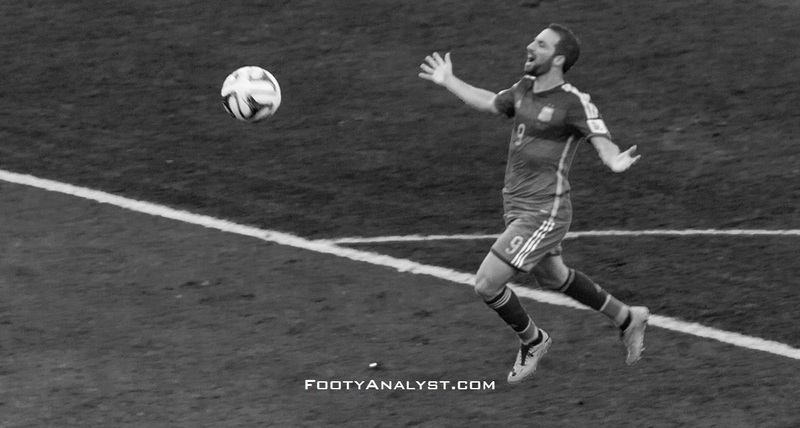 Even though it was a team effort from Argentina, Gonzalo Higuain proved to be the difference. That alone is something that many will be grateful for forever. The one thing we need to address is the reason Higuain is vilified for his misses in Argentine colours. For the most part, it has much to do with the obsession of fans wanting to see Messi lift a trophy for his country. While that desire is certainly justified, the failure is often linked to Higuain’s obvious miss. The vilification becomes something else. This is not to discard the fact that Higuain does have a tendency to go missing during big games for both club and country. But vilification of a player who has delivered goals after goals that fans don’t expect during clutch moments is unjust. What many don’t realize is that losing those three major finals also affected the entire team. Whatever pain was felt by Messi, his teammates felt it too. Perhaps it was even more for Higuain to bear as he was made the scapegoat. Having a history with Real Madrid also caused a huge backlash as Messi’s Barcelona fans portrayed Higuain in a poor light. With that said, the time has come to put these to rest. Argentina are on a rebuilding process and have to move forward rather than looking in the rear view mirror. Higuain’s retirement, is some aspect, will force current coach Lionel Scaloni to look at other alternatives. For many, Gonzalo Higuain has done his part for the country. He has been the best Number 9 that Argentina have had since Hernan Crespo hung up his boots. Those 31 goals he scored for his country shouldn’t be ignored simply because of three misses. Some of the goals he scored were equally important and the match against Belgium in Mané Garrincha would stand as a testament. It is best to wish that he has a great time in his twilight years with Chelsea or anywhere the road might take him after this. Above all, let us take this opportunity to say Gracias Pipita!